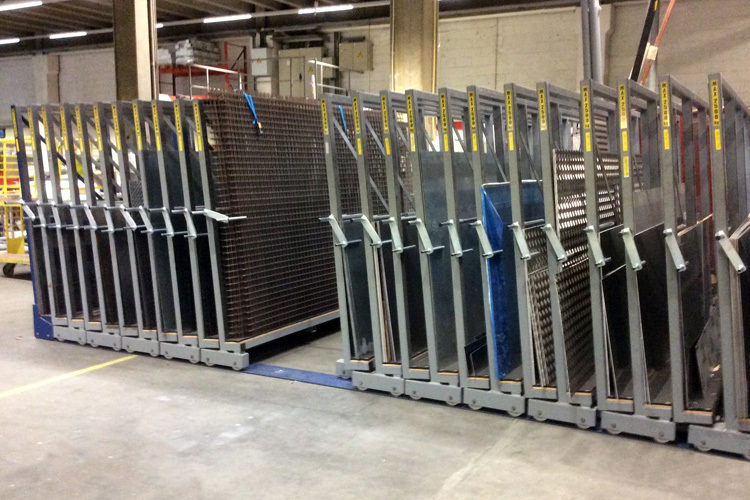 This metal sheet rack with sliding frames is operated manually. 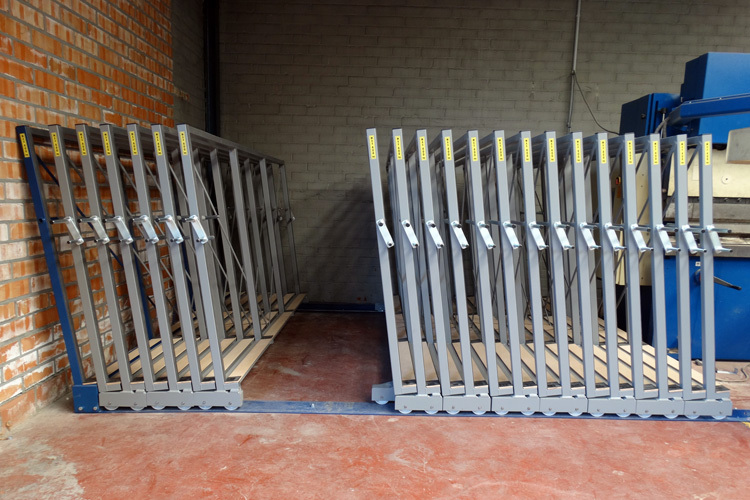 There are 2 versions of this frame rack with manual operation: heavy loading = 3000kg/frame and light loading 600, 500 or 400 kg/frame depending on the model. 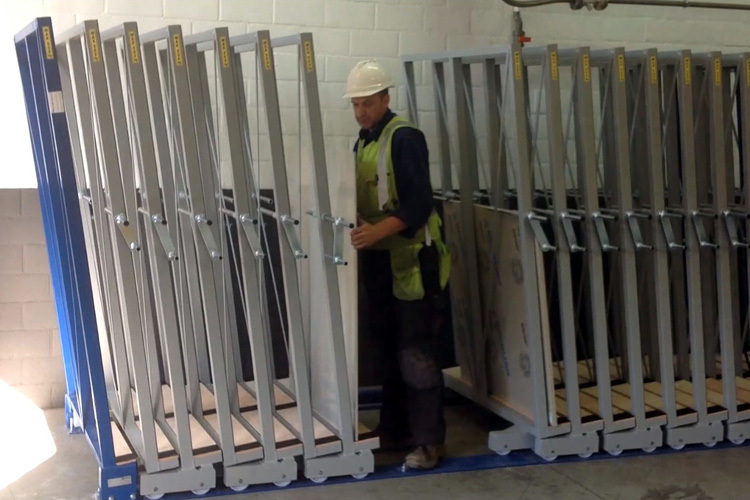 If you require a bigger loading capacity per frame, check out our Mobile frame rack: Electrical operation. 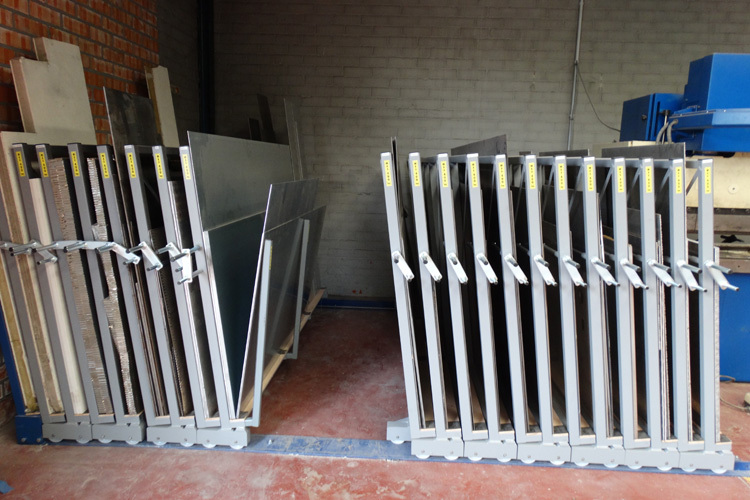 The mobile metal sheet rack with sliding frames ensures a compact and well-structured overview of all your metals sheets, stainless sheets, aluminium sheets, … The frames are equipped with wheels and are mounted on 2 parallel rails for displacement. 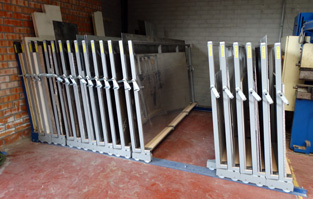 You can manually move the frames to the left or the right. 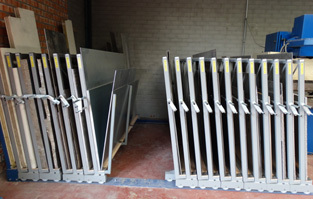 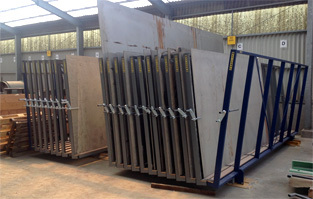 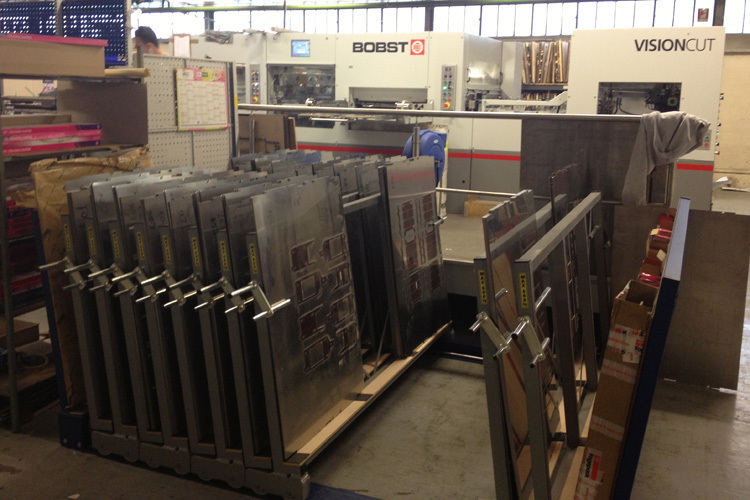 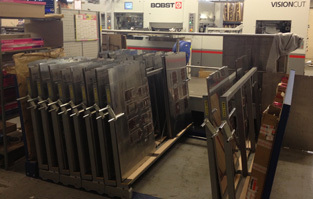 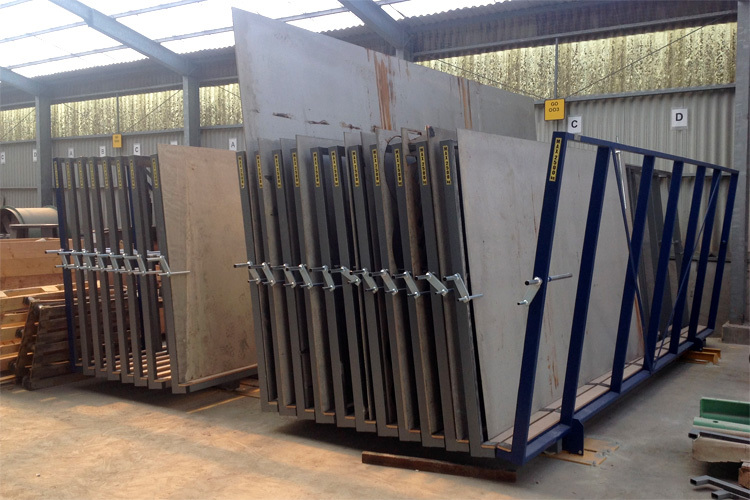 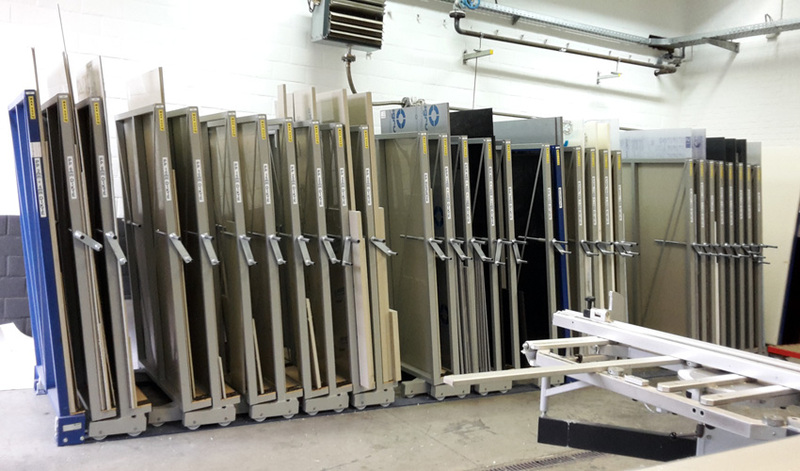 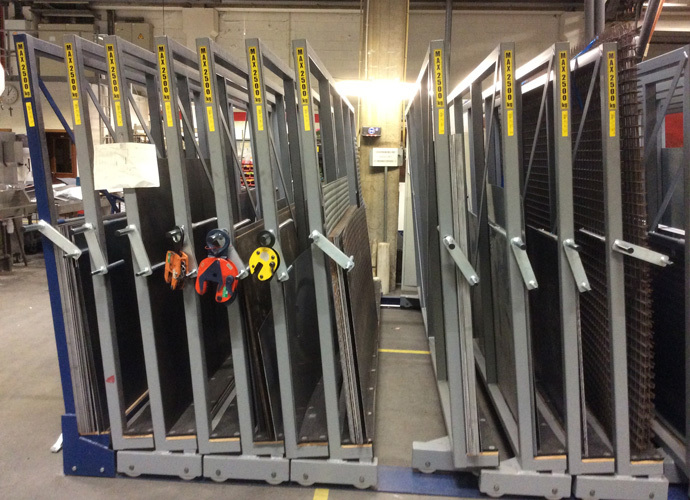 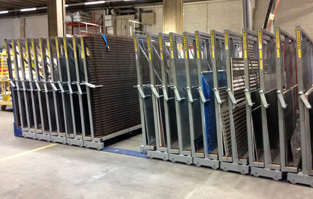 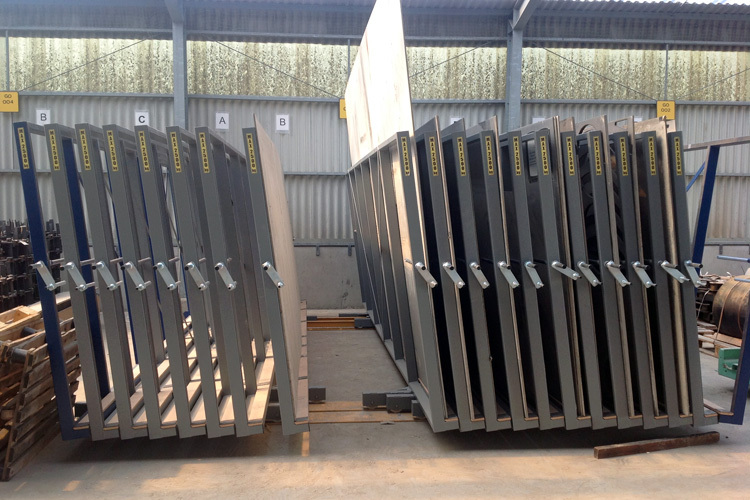 This creates an aisle you can enter to easily and safely pick or load the desired metal sheet. 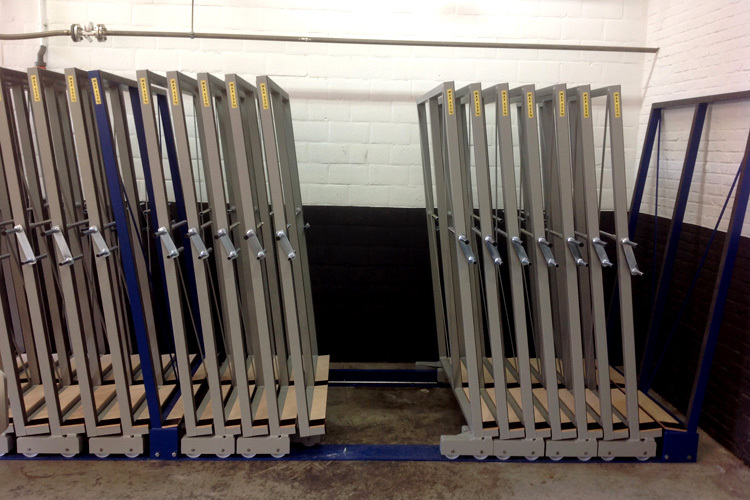 If you are more interested in a completely electrical version, view our Metal frame rack with electrical operation. 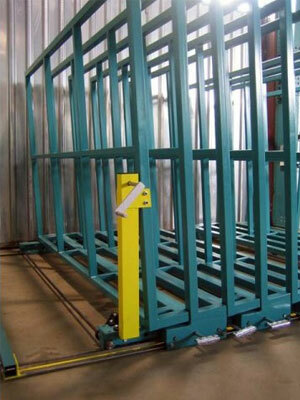 - Type RML: light version with a loading capacity per frame of 400, 500, 600 kg. 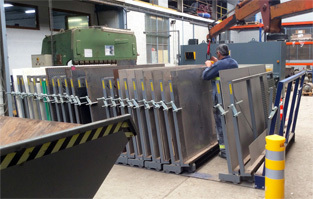 This model is used when you have a bigger quantity of small-sized metal sheets. 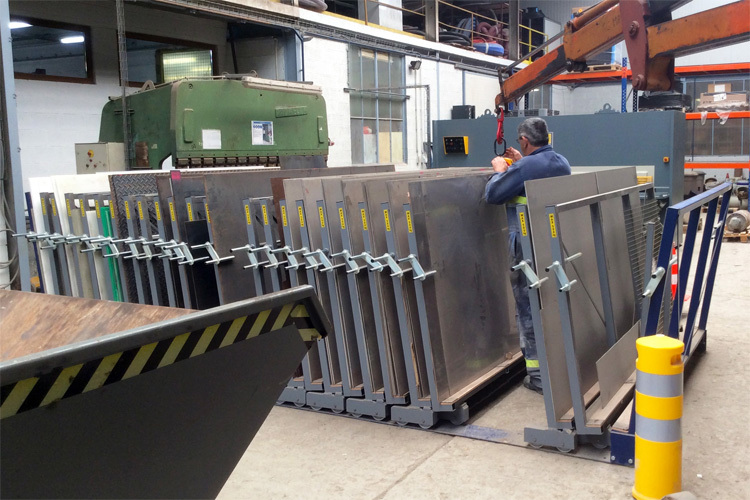 - Type RM: heavy version with a loading capacity of 2500 kg. 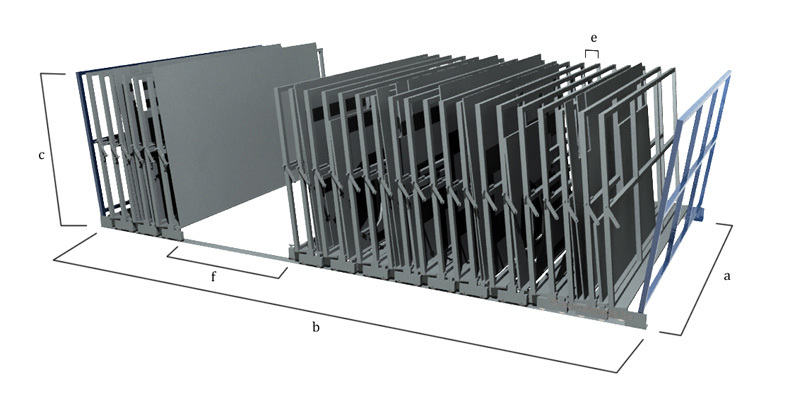 This model is used for a bigger volume of heavy sheets. 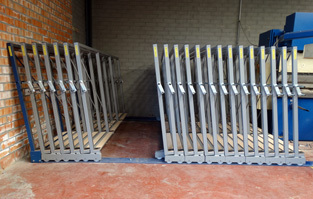 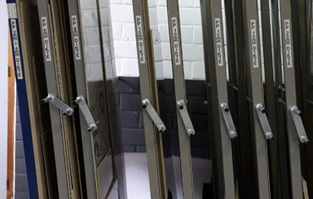 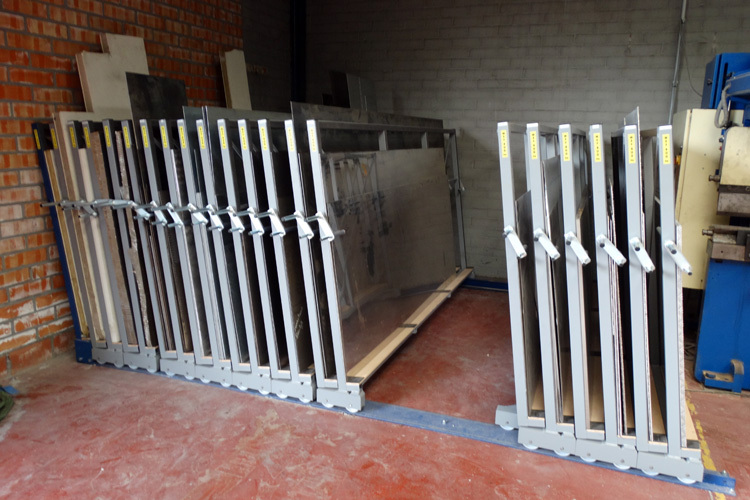 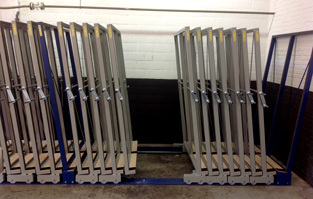 The sliding frame racks are moved by shoving the lever which is placed on the frames. 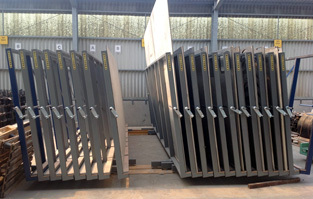 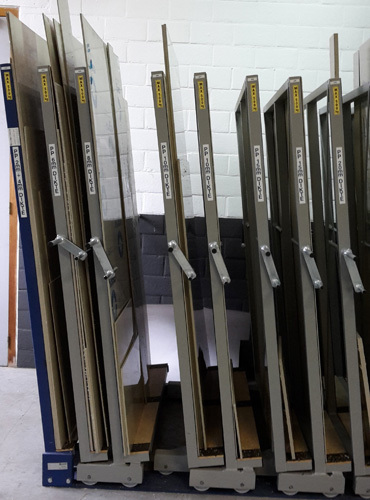 You can shove several frames at the same moment, the quantity of frames to slide is dependent the total weight of the metal sheets which are placed in the frames. 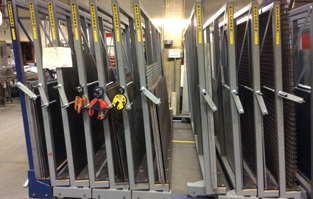 The levers protect also the metal sheets. 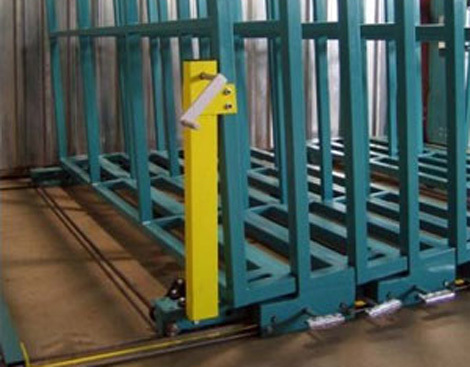 The hydraulic operation of this metal sheet frame rack is similar to the operation of the mobile electric version, but the movement of the frames is done with a lever instead of an electric controller. 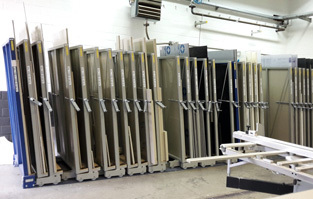 If you would like to learn more about the dimensions and prices, contact us.